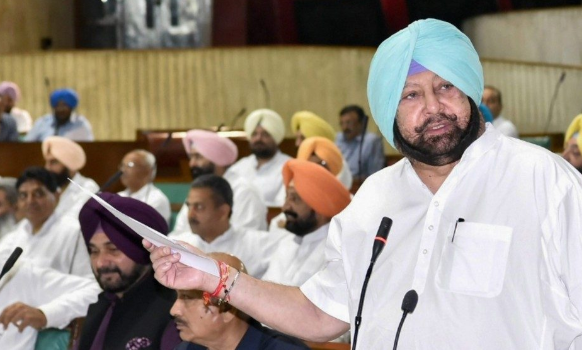 The Punjab state assembly recently passed a bill for an addition to IPC clause 295 to give life imprisonment for any ‘injury, damage or sacrilege’ of four religious books, (Guru Granth Sahib, Koran, Bible and Geeta) ‘with the intention to hurt the religious feelings of the people’. This is the first time in independent India that a punishment usually given for willfully murdering another human being has been recommended for defilement of religious books. In an article in the "Times of India" (September 6, 2018), Punjab chief minister Capt Amrinder Singh of Congress has justified the bill and tried to explain its context. From 2015 to 2017 before the last assembly elections, the state had witnessed more than one hundred cases of sacrilege of Guru Granth Sahib, the holy book of Sikhs who form the majority in the state, and its torn pages were found at many places. Two people were killed in police firing on people protesting against this sacrilege. According to him, these acts of sacrilege were a conspiracy to spread communal unrest and amounted to ‘national security threat that needs to be dealt with an iron hand’. A similar bill was passed by the earlier Shiromani Akali Dal (SAD) government, asking for life imprisonment only for the defilement of Guru Granth Sahib. The bill was returned by the NDA central government with the argument that in singling out the holy book of Sikhs it went against the principle of secularism enshrined in the Indian constitution. The Amrinder Singh government has now added the other three religious books, to make the bill ‘secular’. Many commentators, civil rights organisations and a group of retired bureaucrats have decried the bill. They have highlighted its anti-secular character, threat to freedom of expression, and potential for gross misuse by state authorities and fundamentalist forces. It needs to be noted that no major political party or organization of the state has come out against the bill. Only Dr Dharamveer Gandhi, the MP from Patiala, and non-parliamentary left groups in the state have given public statements against the bill. Some sections within Congress like Chidambram have expressed their disagreement with the bill, but they are a small minority. The bill and the political support it has received are a sign of longstanding misunderstandings of secularism and political and administrative malpractices in India. Given the scale and number of incidents of sacrilege of Guru Granth Sahib in 2015-16, it is reasonable to assume that these were result of a conspiracy to agitate Sikhs for definite political ends. Further, it is also likely that this conspiracy enjoyed political patronage from certain sections of the political class of Punjab. The chief minister uses the image of ‘iron hand’ a number of times in his article to emphasise the necessity of a tough response. Yet the fact remains that for nearly three years Punjab police and the two successive governments have completely failed to bring perpetrators of this communal conspiracy to book. This is not an uncommon occurrence. The most abominable communal conspiracy of the post independent India was for the destruction of Babri mosque in 1991. However, no one has been punished for that heinous crime till date. Needless to say, failures of state authority to apprehend and punish perpetrators of communal conspiracies have only emboldened communal forces. No ‘tough’ law can cover up this dereliction of a primary duty by Indian state. The Punjab government believes that their law is secular since it prescribes equal punishment for sacrilege of books of all major religions. It is further argued that the motivation for the bill is not to protect any religious sentiment, which would be the case with religion based laws like Sharia laws in Pakistan, but to defeat plans of spreading communal strife. The latter it is claimed is a purely secular motivation without any sectarian interests. Both arguments are based upon a gross misunderstanding of secularism. Democratic states are expected to be secular so that every citizen enjoys equal right of religious freedom without any hindrance from the state or other citizens. Hence, by definition a secular state cannot encourage deliberate and mischievous sacrilege against any religion. However, it does not mean that it has to show ‘equal respect’ to all religious practices. If any religious practice is found to violate requirements of democracy, then a secular state can declare it illegal. This is what the Constitution of India did with untouchability. This means that religious sentiments do not a priori enjoy greater privilege or value than other public sentiments. There is no reason why the hurt to religious feelings should attract greater punishment than the hurt caused by misogynist orcasteist abuses. In fact since the latter are invariably meant to humiliate and assert power over women and Dalits, these should attract greater punishment. Any just legal system determines the severity of the crime on the basis of its fundamental values, and gives punishment in accordance with the degree of crime. By declaring sacrilege to be in the class of most serious crimes, the bill demands that religious sentiments enjoy greater importance than constitutional values like freedom from oppression, and fundamental rights. The second argument in favour of the bill confuses ‘hurt to religious feelings’ with communal strife. Believers of a religion can claim to be hurt by any number of statements or actions by others. In India the most commonly claimed causes of hurt to religious sentiments have been books, films, and scholarly research. The bill further adds to the quiver of hurt to religious sentiments by very mischievously adding ‘sacrilege’ to the list. The latter is a theological concept. Its practical implications are determined by religious doctrines, whose interpretations are the privilege of a religious establishment. Hence, the bill pushes Indian legal system very dangerously towards theocracy. All of the above do not have any connection with communal strife. The latter occurs when public peace is affected due to a clash, physical attack on citizens, or destruction of property. If a group of believers claiming to be hurt by a statement or action by someone else go on a rampage, then they are responsible for communal strife, and need to be punished. Passing on the guilt of communal strife to the supposed cause of the hurt cannot be sustained legally. The bill shifts the constitutional balance between fundamental rights of freedom of expression and religion on the one side and the powers of the sate machinery and organized social bodies to restrain these rights on the other. In the current social context when rationalists like Dr Dabholkar, Dr Panasare, Prof Kalburgi and Gauri Lankesh have been murdered for hurting Hindutva religious sentiments, M Farook of Coimbtore was hacked to death by Islamic fundamentalists for declaring himself to be an atheist, and lynch mobs are targeting minority citizens in the name of cow protection, it is necessary to reaffirm the primacy of rights to life, freedom of expression, and conscience. The bill goes in the opposite direction and willy nilly strengthens the hand of fundamentalists. It needs to be noted that article 19(1) of the constitution does not permit any restraint on the freedom of speech on the basis of sacrilege. The right to freedom of religion includes the right to critically assess existing religious beliefs to fashion different beliefs. That is how any religious reform takes place. Many Sikhs in Punjab keep Guru Granth Sahib at home and pray to it. Anyone seeking personal vendetta may claim ‘injury (or) damage’ to the book kept at someone’s home. The bill appears to be designed for misuse. Internal reform, rationalist critique, scholarly investigations, and everyday religious practices, any of these can be declared crimes under the bill. While the two successive governments of Punjab failed to nab conspirators of the desecration of Guru Granth Sahib in 2015-16, the people of Punjab gave a fitting reply to the conspiracy by not falling for it. Public peace was largely maintained and the state had a peaceful transition of government in subsequent elections. Instead of learning from the people, both the Congress and the SAD are taking Punjab along a dangerous path that will gladden only communal fundamentalists. Both parties are kowtowing to communal fundamentalist demands that are against constitutional secularism and freedoms of expression and religion. The bill passed by the Punjab assembly should be scrapped. If the Amrinder Singh government persists with it, then the Central government should prevent it from becoming the law of the land.